Don't want to mow yourself? Click here for more information on our mowing program. Proper mowing is extremely beneficial in maintaining a great looking, stress, weed and disease resistant lawn. Here are some tips to help you achieve that amazing clean cut look every time. Grass should be cut at least once a week (4-7 days), during the morning or evening hours if possible. This ensures that the grass hasn't grown too much between mows, minimizes the build-up of lawn thatch and protects freshly cut grass from the hot afternoon sun. The rule of thumb is that no more than 1/3 of the grass blade should be cut during each mow. Although height ultimately depends on grass type, soil type and moisture content, we recommend a mow height of 2.5-3.5 inches. DO NOT cut your grass too short! Too often we see homeowners scalping their lawns resulting in sun and root damage. Generally we find that a slightly higher cut benefits lawns in the hot dry months, and a shorter cut in the cool damp months. For the last mow of the year, we recommend a height of 2 inches. This minimizes rodent and winter damage during the winter months and allows for easier de-thatching in the spring. Razor sharp blades allow the grass to have a clean professional look and cut. Dull blades can leave the grass ends frayed and damaged, resulting in a higher chance of disease, drought or sun damage. We recommend you sharpen your blades every 4-6 weeks. Grass cycling is when you alternate between bagging and mulching your grass. Mulching during every mow can contribute to thatch build-up and possibly choke out your lawn. Bagging during every mow could rob your lawn from the nutrients it needs. We recommend you mulch your lawn once a month or after a fertilizer application and bag the rest. Simply put, yes, patterns do matter! Not only do they make your lawn look professional and clean. Alternating mow patterns from week to week increases root and blade strength as well as minimizing wheel ruts left on moist soft soils. The machine that ultimately cuts your lawn also has to be maintained properly. Cleaning the mower is something most homeowners often forget. Grass debris builds up under the mow deck resulting in poor bagging and mulching. Weeds can also be spread throughout your lawn or on to your neighbour's lawn from a dirty mower. A putty knife is a great tool for removing caked on debris from under your mower. It's also important to clean your air filter regularly and change your oil at least once a year. 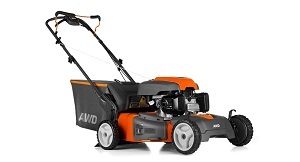 This ensures your mower isn't underpowered and continues to mow for years to come.